ĐẮK LẮK – Ethnic minority households in Ea Trang Commune in Đắk Lắk Province’s M’Đrắk District have escaped poverty by planting thousands of hectares of acacia forests on barren land and hills. Y woanh M’lô, who has planted 4ha of acacia in Ea Trang’s Mduôi Village since 2003, has harvested the acacia trees twice, earning a profit of VNĐ200 million (US$8,600) each time. Previously, he had planted cassava and coffee on his hilly 2ha land, but the income could not cover his family’s living costs as the plants had very low yield due to infertile soil and hilly land. With the encouragement of local authorities, M’lô switched to acacia in 2003 and received an additional 2ha of acacia trees later that year from a government project that began in 1998 and aimed to plant five million hectares of forests. The Núi Vọng Phu Protection Forest Project Management Board in M’s Đrắk District provided acacia seedlings, fertiliser and instruction in planting techniques for local households who participated in the project. After harvesting acacia, the households only have to pay back the costs of seedlings and fertiliser to the management board. Local authorities worked with the Wood Chip Plant of the Tiến Nam Co-operative to buy all harvested acacia from locals, guaranteeing outlets. Y Đôi Niê, chairman of the Ea Trang Commune People’s Committee, said the turning of ineffective crops into acacia areas had developed thousands of hectares of forests on bare hills, prevented soil erosion, and preserved underground water for agricultural production. At the base of hills in the commune, local farmers developed 400ha of wet rice fields that grow two rice crops a year. 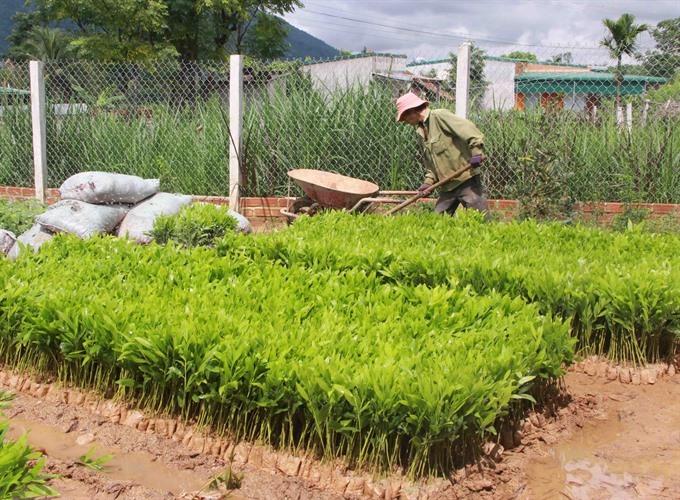 The value of forests is larger than that of other crops, so locals have invested adequately in planting forests in recent years, according to Nguyễn Thế Thập, head of the M’Đrắk District Agriculture and Rural Development Division. To develop forests sustainably, the district has asked its communes not to expand forest areas but to invest in techniques for growing forests and use new types of acacia seedlings produced from tissue cultures or branch cuttings to improve productivity. Y Thin, who began growing acacia on his hilly 3ha land in Mduôi Village in 2003, said that acacia was suited to the commune’s soil conditions and weather, and that the trees only required tending in the first year. Y Thin has earned a profit of VNĐ150 million ($6,450) per harvest. Acacia trees are normally harvested five years after planting. To improve yield, he bought new acacia seedlings produced from branch cuttings in the southern province of Đồng Nai to grow in the rainy season this year. His acacia trees can yield 100 -120 tonnes per ha after three to four years. Ea Trang commune covers an area of 27,000 ha, of which 80 per cent is forested, according to the commune’s People’s Committee. Of the commune’s 1,298 households, 96 per cent of them are ethnic minorities, which include the Ê đê, M’ nông and Ba na. Niê said many primary forests in the commune were destroyed during the American War, leaving thousands of hectares of bare hills. To develop the economy and eliminate poverty, in 1994 the commune’s Party Committee and People’s Committee encouraged local people to use bare hills to grow acacia. Local authorities have tried to raise public awareness about the importance of growing acacia forests on bare hills. The commune now has more than 3,000ha of planted forests, and more than 80 per cent of the commune’s households have a forest-based livelihood.